21-23. Then Jesus went thence, and departed into the region of Tyre and Sidon. And behold, a woman of Canaan came from that region, and cried unto Him, saying, "Have mercy on me, O Lord, Thou Son of David; my daughter is grievously vexed with a demon." But He answered her not a word. Why did He not allow the disciples to go by way of the Gentiles [Mt. 10:5], while He Himself went to Tyre and Sidon, which were Gentile cities? Learn then, that He did not go there to preach, since, as Mark says, "He hid Himself" [Mk. 7:24]. But rather, when He saw that the Pharisees had not accepted His words about food, He went to the Gentiles. The woman said, "Have mercy, not on my daughter, who is unconscious, but on me who am suffering and experiencing these terrible things." And she did not say, "Come and heal," but "Have mercy." He did not answer her a word, not out of contempt, but to show that He had come, in the first place, for the Jews, and to shut the mouths of those Jews who might later slanderously accuse Him of doing good to Gentiles. He also refrained from answering her so that He might reveal the persevering faith of the woman. 23-24. And His disciples came and besought Him, saying, "Send her away; for she crieth after us." But He answered and said, "I am sent only unto the lost sheep of the house of Israel." 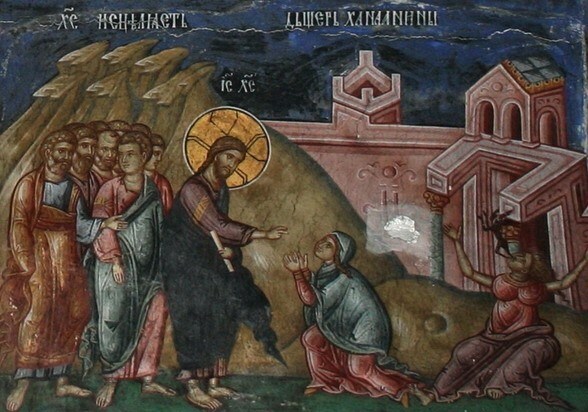 The disciples were oppressed by the cry of the woman and so begged Christ to send her away. They did this, not out of a lack of compassion, but rather with the desire to persuade the Lord to have mercy on her. But He said, "I am sent only unto to the Jews, who are lost sheep because of the wickedness of those shepherds to whom they have been entrusted." In this manner He discloses more fully the faith of the woman. 25-27. Then came she and fell prostrate before Him, saying, "Lord, help me." But He answered and said, "It is not meet to take the children's bread, and to cast it to dogs." And she said, "Yea, Lord, yet even the dogs eat of the crumbs which fall from their masters table." When the woman saw that her advocates, the Apostles, had not succeeded, again she approaches fervently and calls upon the Lord. Christ speaks of her as a dog, because the Gentiles led an unclean life and were involved with the blood of meat sacrificed to idols, while the Jews He speaks of as children. But she answers wisely and indeed profoundly, "Even though I am a dog and not worthy to receive a loaf of bread, that is, a mighty act and a great sign, nevertheless grant this to me which is a small thing by comparison with Thy power, though to me it is great. For crumbs are not large in the eyes of those who eat loaves, but to dogs they are large, and they feed on them." 28. Then Jesus answered and said unto her, "O woman, great is thy faith: be it unto thee even as thou wilt." And her daughter was made whole from that very hour. 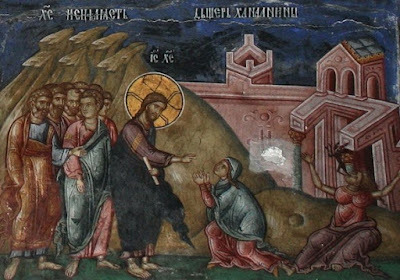 Now Jesus shows the reason why He put off healing her at the beginning: So that the faith and understanding of the woman might be made manifest, Christ did not immediately give His assent at the beginning and even drove her away. But now when her faith has been revealed she hears the words of praise, "Great is thy faith." By saying, "Be it unto thee even as thou wilt," Christ showed that if she had not had faith she would not have obtained her request. So, too, if we desire to obtain something, nothing prevents us from obtaining what we desire. Notice that even if saints should ask on our behalf, as the Apostles did for the woman, still, we accomplish even more when we ask for ourselves. The Canaanite woman is also a symbol of the Church gathered from among the Gentiles. For Gentiles who first were even driven away, later were advanced to the rank of sons and were deemed worthy of the Bread, I mean, the Body of the Lord; while the Jews became dogs, thinking that they were being fed by the crumbs, that is, the minute and insignificant details of the letter of the law. Tyre means "besieged," Sidon, "they who hunt," and Canaan, "made ready by humility." Therefore the Gentiles, who were besieged by evil in that the demons were among them hunting for souls, were also made ready by humility. For the righteous were made ready for the heights of the kingdom of God.